The undergraduate experience can be an exciting and, sometimes, stressful time. We want to make sure you know about all the exciting opportunities awaiting your student, and provide a guide to help make your student’s experience at the Heavener School successful. Your student is joining a dynamic and welcoming community of students, faculty and staff dedicated to bringing the best out of each and every one of our undergraduates. The key to a truly fulfilling experience at the Heavener School is balance. We want our students to excel academically, but we don’t want them living in the library and studying nonstop. Ideally, Heavener students should spend an equal amount of time on four important phases of the Heavener experience. At the heart of Heavener is a diverse and dynamic academic curriculum that challenges students to think critically and inspires innovation. The College offers seven undergraduate business degrees—Bachelors of Science degrees in Accounting, Economics, Finance, Information Systems, Management and Marketing, and a Bachelor of Arts in General Studies. The College also offers six minors—Accounting, Business Administration, Entrepreneurship, Information Systems, Real Estate and Retailing—to further enhance your business acumen. Our advisors are eager to help your student decide which major is the best fit. Students are encouraged to meet with advisors during their first semester to formulate their four-year plan. Information about tutoring and academic success workshops is offered through UF’s Office of Academic Support. The Heavener School is dedicated to enhancing our students’ career prospects from Day 1. Through our various career development programs and assistance from our skilled academic advisors and career coaches, Heavener equips its students with the skills to successfully navigate the competitive job market. Heavener students will receive personalized attention and individual career coaching from award winning advisors who can help them find a best fit career in the world of business. Involved students will complete an internship, develop transferable business skills, build a professional network and create a great résumé. Have your student join student organizations! The Heavener School has 35 student organizations to choose from. Current students and alumni have said one of the most important keys to their success was getting involved in student organizations. Getting involved and interacting will make an enormous difference during their four years at the Heavener School. Have your student join a leadership program! A major area of emphasis at the Heavener School is transforming our undergraduates into leaders. The School’s Career & Leadership Programs office supports our students’ personal and professional development helping them utilize the critical leadership skills demanded by employers and graduate programs. This is an invaluable experience for your student that helps them reach their maximum potential. Have your student meet with a Heavener international study advisor during their first semester. Participating in study abroad is one of the most memorable experiences our students will have. It also satisfies a College requirement as Heavener students must participate in either an international trip or an internship before graduation. Learn the advantages of international study and when is the best time to complete your semester abroad. Have your student enroll in Introduction to Business (GEB2015) in their first semester at UF. Introduction to Business (GEB2015) provides new students insights to the many opportunities Heavener School has to offer. A Heavener upperclassman is assigned to each Introduction to Business class and serves as its Peer Leader. Each Introduction to Business class is limited to about 25 students, allowing your student the opportunity to make meaningful connections. Have your student meet with an advisor every semester. The Heavener School academic advisors are dedicated to help students navigate through their undergraduate experience, providing guidance on degree requirements, adding and dropping classes and career advice among other functions. Students are encouraged to meet with advisors during their first semester to formulate their four-year plan. The sooner students meet with advisors, the sooner they can be set on a path of success. Schedule a one-on-one appointment, drop by our office for a walk-in meeting. Gainesville is located in North Central Florida with a population of about 200,000 (residents and students) and many amenities found in much larger places. Just an hour or two in any direction will take you to beautiful beaches, Disney World and Universal Studios Theme parks, crystal clear springs and rivers. Gainesville has become a mecca for runners and cyclists. Golf, swimming, soccer, tennis and racquetball are also popular. There are activities to fit everyone’s lifestyle. Getting to and around Gainesville is easy. The main highways are I-75, US 441 and US 301. Gainesville Regional Airport is served by major airlines and commuter flights. Around town, the Gainesville Regional Transit System (RTS) offers bus service free for UF students. The temperature averages a mild 70° F, but it can get very warm in the summer and very cold in the winter. The Warrington Diplomats are Heavener’s official student ambassadors. 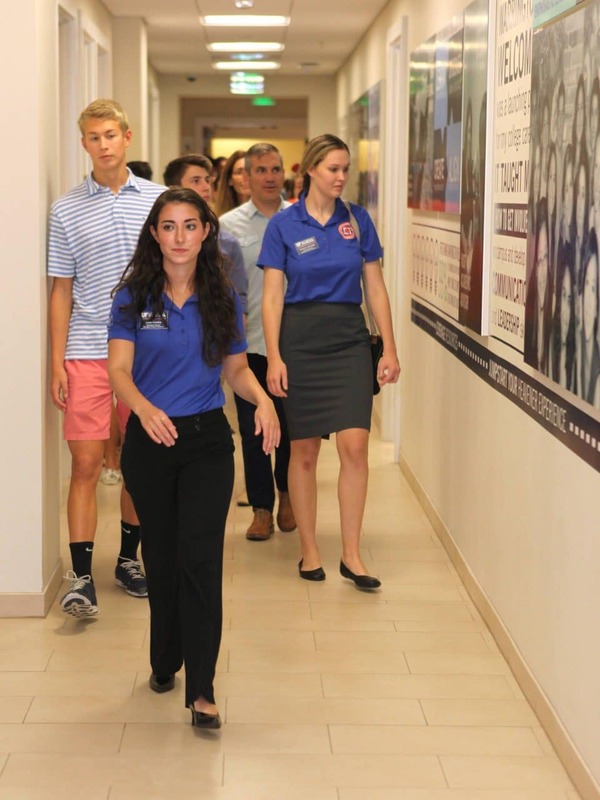 During fall and spring semesters (Sept-Apr), they offer tours for prospective students and guests.